@Raja – did you complete Step 3? The error says that you don’t have the hdf5 library for Lua installed. Fantastic work, Jeff! I trained a network using the tweets and transcripts of a very controversial politician from my country and I made a Twitter account that tweets his thoughts (clearly, I was inspired by @DeepDrumpf :) ). I have a question: I don’t quite understand how the -sample parameter affects the output. Could you please provide an insight? @Alejandro – glad it helped! When you get it done, post a link here! Re sample I’m not entirely sure – it has something to do with the way the RNN is encoded and sampled from. There’s a hint about it here. It seems that setting -sample 1 will give more novel results, but probably also risk being less intelligible, like temperature. Afraid that’s all I can surmise, for more you’ll probably have to do some research. Cool! I’m still trying to improve its grammar but I’ve obtained pretty funny results (for example: “Good morning, postmoderns” (he is an ultra conservative politician so it’s funny, hehe)). (the tweets are in spanish). @Raja – did you get any errors when you installed the HDF5 library for Lua? Can you look in the HDF5 path it lists (/usr/local/Cellar/hdf5/1.10.1/include;/usr/include;/usr/local/opt/szip/include/hdf5.h and see if it’s there? Receiving objects: 100% (28/28), 20.25 KiB | 0 bytes/s, done. I was able to find the hdf5.h in the /usr/local/Cellar/hdf5/1.10.1/include folder, but was able to locate the file in /usr/local/opt/szip/include/ folder. So I went and copied the file from the other folder and tried to run the script. But I am getting the same error! Copying the file ratified the previous error! Sorry again, the previous error still exists. please help! @Raja – I’m not sure. These installs sometimes depend one thing on another, so it might be best to uninstall all the Lua stuff and start over. Otherwise, you’ll have to try a Lua forum, I don’t know much about how to use or troubleshoot it. 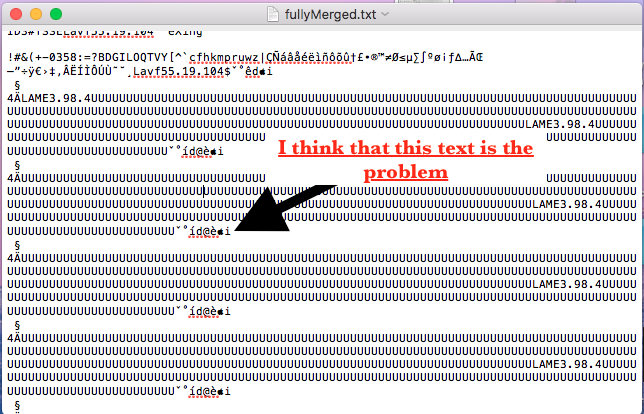 @Nerdcortex – it appears a lot of people have this issue with the HDF5 library. You can see this solution, which should work: http://www.jeffreythompson.org/blog/2016/03/25/torch-rnn-mac-install/comment-page-1/#comment-275266. Your other issue, I think, will be solved when you get HDF5 working, no? @charles can you help me out with the hdf5 installation on mac? When I click the link to “follow these instructions” it’s just a bunch of posts of people debating the problem, there are no instructions there? Is there a clean set of instructions for newer OS-X? Thanks for the excellent tutorial! I’m stuck on step 3, however, when attempting to install hdf5. Running MacOS Sierra. And it just hangs. And hangs. And hangs. For over an hour until I finally get fed up and ctl-C out of the program. I’ve followed step 1 to the letter (step 2 doesn’t apply since I don’t have NVidia). Am I doing something wrong? Hi Jeff, I’m new to all this but so far everything’s been really easy to follow. My problem isn’t really with error messages as much as just nothing happening, I think the step I’m stuck on is importing the h5py library for python. Once I type Python and then Import h5py, I get a >>> that just sits there for ever. At first I didn’t realize I hadn’t successfully negotiated that step and had been trying to train, and a similar thing was happening, I think I was getting a >… that was just hanging there indefinitely but I never got any feedback telling me anything was happening except my terminal window didn’t want to close. @Tori, ah I (think) that’s an easy one! That’s actually a good sign, showing that h5py imported correctly and it’s ready to go – the >> is a Python prompt where you’d type code. You can just type exit() and continue to the next step! anyway i still have the problem of training, i don’t have a GPU so i’ve been adding the -gpu -1 flags but no matter how long i let my computer sit i never get any response. it doesn’t tell me anything’s “running with not-cuda on cpu,” i get no “epoch” anything, ever. i also haven’t gotten any error messages though, so it’s hard to actually search what’s wrong. is nothing wrong? do i just need to wait more than ~10h for the first output? oh wait never mind now i have the same unable to locate HDF5 header file at /usr/local/Cellar/hdf5/1.10.1_2/include;/usr/local/opt/szip/include/hdf5.h error as everybody else! horay! So here’s what I did. I’ll try to format as clearly as I can. Mostly it has to do with editing the .lua files in the install directory, which for me was /Users//torch/install/share/lua/5.1/hdf5/. Now, I did a few other updates and things that I can’t quite remember, so no guarantees — but I at least did these three things. return "[HDF5Group " .. self._groupID .. " " .. hdf5._getObjectName(self._groupID) .. "]"
return "[HDF5Group " .. tostring(self._groupID) .. " " .. hdf5._getObjectName(self._groupID) .. "]"
And then, FINALLY, it started training again with the th command from Step 7. Hopefully this works for you too! Yikes, thanks Zach for such detailed info! I’ve put off installing Sierra because I know it will break *everything*. Great tutorial Jeffrey! 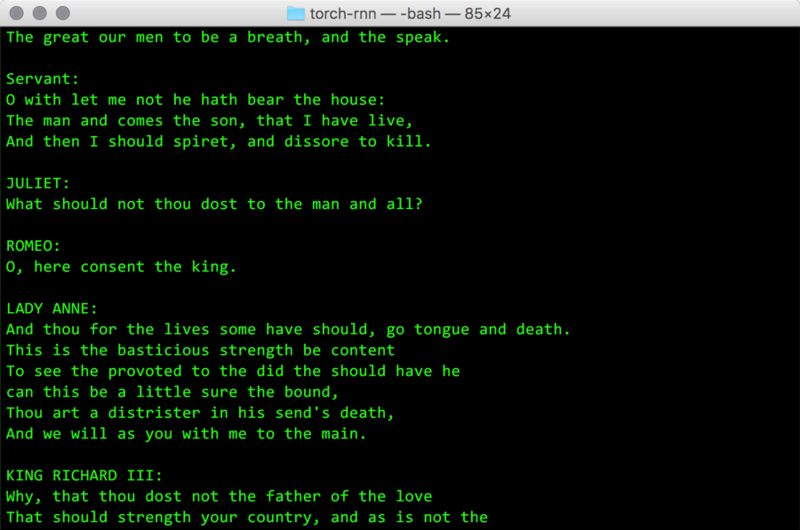 I was able to successfully create the my_new_shakespeare.txt file! Now, I want to try to do this with an audio file. I have combined 500 mp3 files into one big mp3 file, but am having trouble putting it into the Machine Learning engine. Please let me know of any sources I can use to load audio into the torch system. @Ruchir – thanks! Torch-rnn is really just meant for text, so it won’t work easily with audio. MP3s would be particularly difficult since the data is compressed instead of linear, much like a JPG. You might be able to try it with raw WAV data and add the header at the end using Audacity. Do you know if there is a way to get a textual data representation of the audio file without a UnicodeDecodeError? Is this installation still possible by just skipping Step 2? @Matt G – dunno, you’ll have to try it! @Ruchir – I see “LAME” in there which suggests maybe you didn’t actually create a WAV file? There should be some info above about modifying the Python code to deal with Unicode characters. I worked through the issue above, it had something to do with an outdated version of Xcode and Luajit. I have made it to step 7, and now I’m running into this error. I have no idea what the problem is here. Any help is appreciated. @ZackB – did you add it to your PATH variable in step 1? @ZackB – I have no idea, you might have to post to a Lua forum for that. I’m stuck starting Step 7 running in OSX El Capitan 10.11.6. Anyone know how to fix these errors? /Users/robert/torch/install/bin/luajit: /Users/robert/torch/install/share/lua/5.1/hdf5/file.lua:10: HDF5File.__init() requires a fileID – perhaps you want HDF5File.create()? Can’t find much via searching about what’s wrong. I assume there’s an unsupported character in my data file? @Jason – there’s a bit about that in the tutorial, probably a Unicode character that throws an error. You can strip non-ascii characters, or try my mod above. I also had to modify one other file, to wrap a “tostring()” around something. This may be a redundant post and if so, my apologies, but I could only get torch-rnn working on macOS 10.13.3 by installing hdf5 1.8.20 and not 1.10.0. Taking that change into account, everything else worked fine. I am also running into a problem of ‘Expected value but found invalid unicode escape code’ while attempting to train rnn model. It works fine training model on tine-shakespare example dataset so I suppose its some characters cannot be processed. I’ve tried taking out non Ascii characters in pre-processing, but it still throws same error. concerning @Tom Schofield fix, for me it was additionally necessary to change the path of the hdf5 library in the config.lua file to the appropriate library in /Cellar/… after that it worked beautifully.